Praise for "The New Leader's 100-Day Action Plan" - 'What a book! New and experienced managers at every level will 'fly' with this programmed learning' - The Honorable Bruce S. Gelb, former vice chairman, Bristol-Myers Squibb. 'I love this book and wish I had read it before stepping into my current leadership role. It provides a practical and indispensable road map to success that will help new leaders stack the odds in their favor. Read it and don't be among the forty percent of leaders who fail in the first eighteen months!' - Sandy Rogers former marketing manager, Procter & Gamble and Apple Computer, and former senior vice president, Corporate Strategy, Enterprise Rent-A-Car Company. 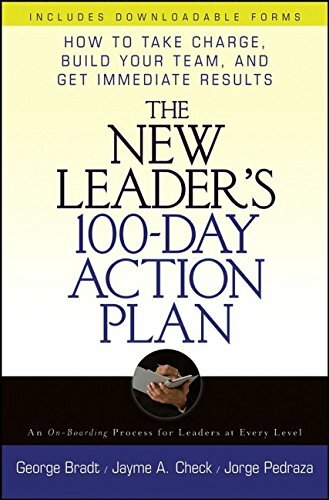 "The New Leader's 100-Day Action Plan" offers a comprehensive architecture with practical tools and techniques for new leaders to follow. I believe that leaders who utilize the advice from this book will have demonstrative business and culture-building results' - Joe Bonito Vice President, Global Leadership Effectiveness, Pfizer. 'One of the most basic yet comprehensive books I've read regarding the dos and don'ts of a successful on-boarding process. A must-read for all aspiring business leaders, from first-time CEO's to executives at every level of the organization. Also a great tool for human resources and talent management executives' - Joe Griesedieck, Vice Chairman, Korn/Ferry Executive Search. Moving into a new position of leadership is one of the toughest challenges a businessperson can face. Nearly half of new leaders fail in their first eighteen months. Often, failure is the result of crucial mistakes made in the first 100 days?mistakes that end up crippling new leaders from the start. Critical mistakes made so early can be devastating for companies and leaders alike. But how do you avoid them? Whether you're a veteran CEO taking over a new organization or a novice moving into your first leadership role, this practical guide will help you manage your leadership transition so you can take charge, build your team, and deliver results. In The New Leader's 100-Day Action Plan, top executive transition experts from PrimeGenesis present proven solutions and cutting-edge techniques for each stage of the process of moving into your new role. From well in advance of your first day on the job, The New Leader's 100-Day Action Plan gives you the tools you need to succeed in your new leadership role.